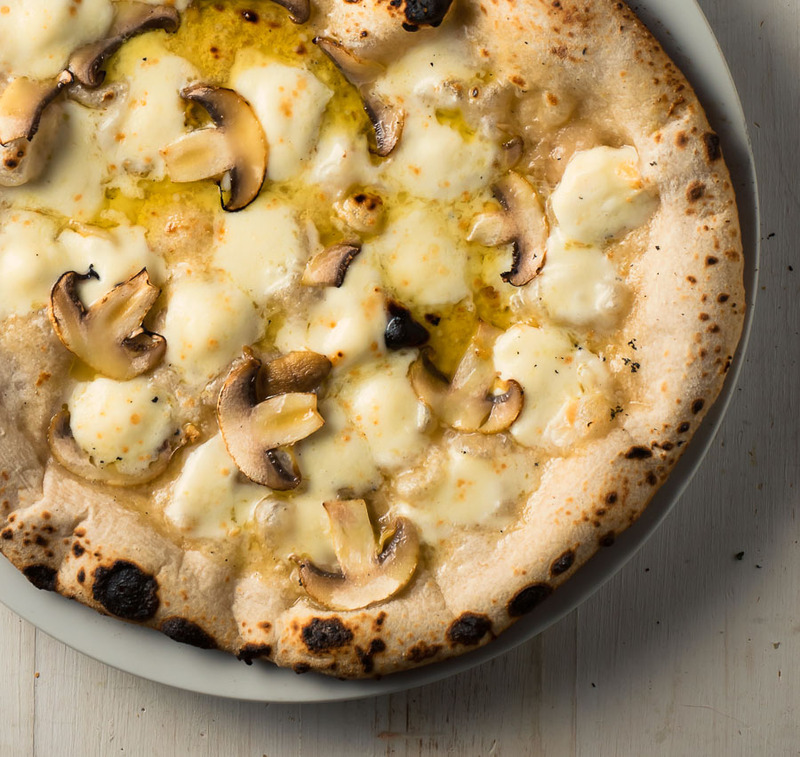 Neapolitan pizza is a magical thing. The crust has a tang. Real flavour. Not that drab, everybody eats around it stuff. And it starts with the dough. This isn’t your everyday pizza dough. Get this right and you will make better pizza than you can buy. For real. Every pizza dough recipe out there goes something like this. Mix up some flour, water, way too much yeast, salt, oil and sugar. Proof it for a few hours. Ball it up. Make pizza. It works. Sort of. There’s something there holding the toppings up. But it’s bland. Simple. Usually pretty dry. Not that good. Nowhere near that magical Neapolitan pizza crust. Think I’m crazy? What can there possibly be to pizza dough? Something delicious. Something special. That’s what. Don’t believe me? Think about that wonderful bread you get at an artisan bakery. The depth of flavour. The texture. Now think of Wonder bread. That’s the difference I’m talking about. This is about artisan. It isn’t really hard to make Neapolitan pizza dough. It is going to seem a bit daunting at first. I’m doing my best to explain it here. It took me a full year to figure all this out. Maybe more. I don’t know how many pizzas I screwed up. A lot. Don’t feel bad for me though. Screwed up Neapolitan pizza is still pretty amazing. This is a long read. The summary of a year’s work. Follow me down the rabbit hole. It’s fun. And the results are sooo worth it. I’m asking a lot here. 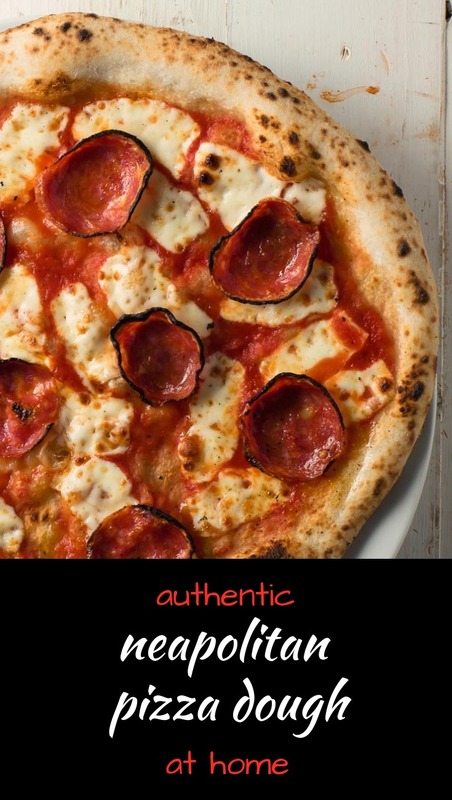 But if you are serious about making the best pizza you have ever had read on. 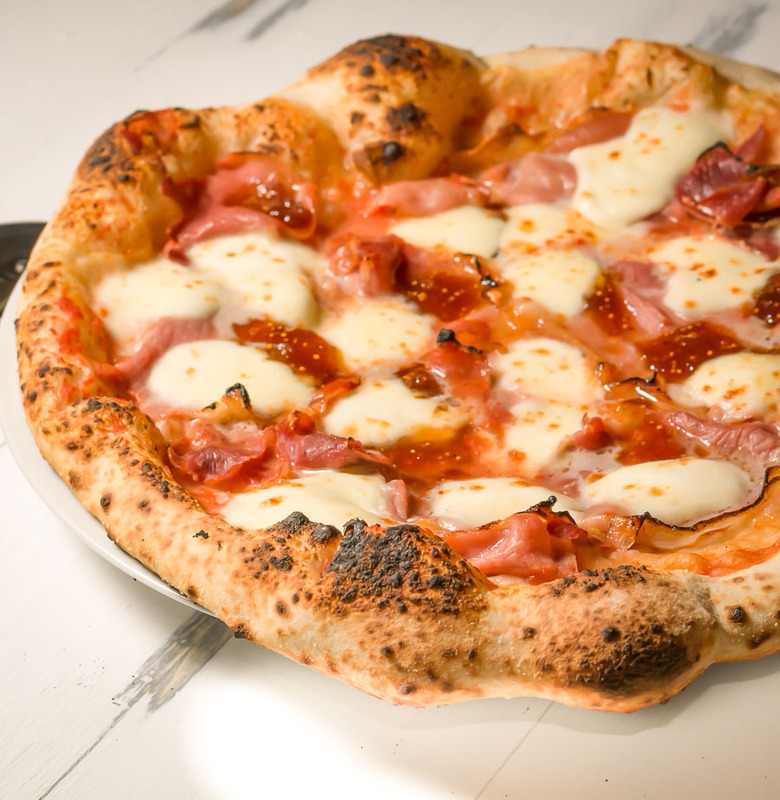 Before you get too far understand that Neapolitan pizza is cooked with high heat. That’s a pre-requisite. You need an oven that gets hot to make Neapolitan pizza. Your kitchen oven can’t do it. Your BBQ might be able to do it. You will need some gear to make this happen. Luckily it’s becoming a thing. There’s the Blackstone. The Ooni. The BakerStone pizza oven works with your BBQ. The days of needing a wood burning oven are behind us. They are still super cool. I still want one. But you don’t need it to make Neapolitan pizzas. What doesn’t work is a pizza stone. 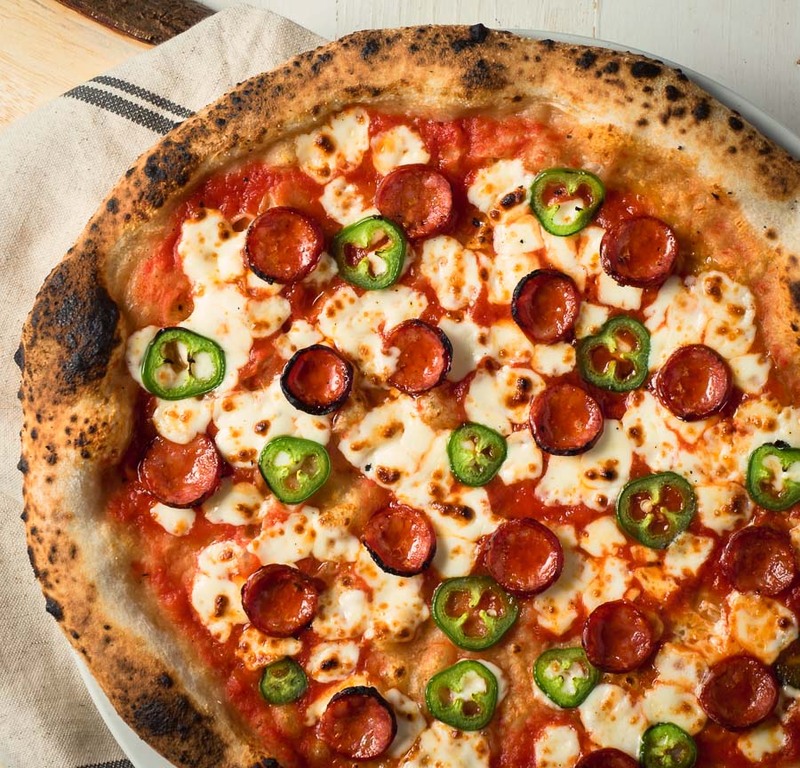 Neapolitan pizza relies on refractory heat. That’s a fancy way of saying it needs heat from above as well as below. Neapolitan pizzas cook in the 750F to 900F range. They cook in under two minutes. 90 seconds from the time the pizza hits the oven to dinner. For real. Try to cook a pizza on a stone at 900F on your BBQ. You get one seriously burnt pizza. Or raw dough on top. There’s no in-between. I tried to make BBQ pizza work for a long time. I gave up. You need an oven that makes pizza. The nice thing is now they are in the hundreds of dollars. Not the thousands like they used to be. And you can use that oven for other things. Want to make nan bread? Sear a steak at 800F? Roast vegetables at high temp? The best nachos you have ever had? All possible with the right oven. You are going to need a scale. Actually you will need two scales. Or a really good one. You probably have one that measures to 1 gram accuracy. That’s good. But you are going to need a second scale. The second one will need to measure to 1/100 of a gram. That covers you if you want to use instant dry yeast. If you are using a sourdough starter 1/10 of gram is fine. Took me forever to figure out where to buy the second scale. I saw them online for hundreds. Medical scales. Too rich for me. Turns out drug dealers need scales that measure 1/100 grams. And they don’t want to spend hundreds of dollars. Go to a smoke shop. That’s where I got mine. Cheap. But it works just fine. You will need a pizza paddle. One that’s big enough. Mine is 14 inches. Works well. A small second paddle you can use to move your pizza around as it cooks is helpful too. You will need an infrared thermometer that goes up to 900F+. These aren’t expensive. And they are super useful. You can use them to measure the room temperature where you will be proofing the dough. That’s really important. You can use it to measure your pizza oven temperature. That’s really important too. And you can use it with your regular oven. Way more accurate than the knob on the front. Great for baking. A stand mixer is the last bit of gear you need. By stand mixer I mean a Kitchen-Aid or Hobart mixer or equivalent. I do not mean a food processor. A dough hook for your mixer is very nice to have. Think about getting one. You could try to do it by hand but that would be real work. I’ve never even tried. If you know what you’re doing though, by hand is definitely an option. There are only 4 ingredients in Neapolitan Pizza Dough. That’s all. No secret ingredients. No sugar. Or oil. None of that. Those are the rules. Not my rules. The rules set out by the Associazione Verace Pizza Napoletana. Seriously. Four ingredients. It’s mind blowing what you can do with those 4 ingredients. The water and salt don’t matter too much. But the flour has to be 0 or 00. All purpose won’t work. At 800F all purpose flour burns. Badly. Don’t try it. Any decent Italian grocer will have pizza flour. I like Molina Caputo 00 in the blue bag. My favourite. But there are lots of choices. Just make sure it says 0 or 00. I use a live sourdough starter. A sourdough starter from Ischia in Naples in fact. Just to give you an idea of how crazy I am. But any good sourdough starter culture will work. If you are into making sourdough bread your starter is perfect. If you have no idea what I’m talking about google it. Sourdough starter. There is a ton of information on it. 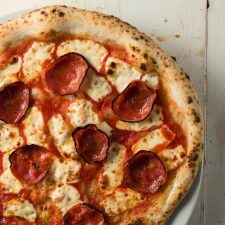 Worth considering as you get into making Neapolitan pizza. Instant dry yeast works as well. But it takes so little instant dry yeast to do this that you need a scale that goes down to 1/100 of a gram. You are going to be measuring a few granules of yeast. Literally. First time I did it I didn’t believe it was even possible. But it is. Time and temperature are the other two ingredients. Key variables in the process. Yeast ferments at different rates depending on the temperature. Colder temperatures. Slower fermentation. Higher temperatures. Faster fermentation. So if time is fixed colder temperatures need more yeast. For higher temperatures less yeast is needed. That’s all you really need to know. A sourdough starter has bacteria in it as well as yeast. The bacteria are what makes sourdough sour. And that’s why it takes so long to make this pizza dough. The bacteria work slower than the yeast. Takes more time for them to add that sour tang. The same bacteria are present in the air. You get the same effect if you are using instant dry yeast. Might not be quite as good as sourdough. But it is close enough to impress the hell out of everybody who tries your pizza. I’ve tried to make dough in 24 hours. It worked. I made pizza. It puffed up. Looked perfect. But it didn’t have the flavour. No depth. It takes 48 hours to really get the balance of properly risen dough and that wonderful sourdough tang. So figure out what room temperature is where you will let the dough sit. And then use the table below to figure out how much starter or instant dry yeast you will need. A lot of complicated concepts here but the formula works. You don’t need to understand it. But you do need to follow it. It will amaze you how little yeast you need. You won’t believe it at first. Nobody does. But it will work. Have faith. Slow fermentation. That’s the key to complexity and flavour. Give it the time it needs to work it’s magic. A little bit of yeast. A long time. That’s the secret. The table gives you the right amount of yeast. Cellar temperature range. If you can’t get into the range because your house is too hot try using a cooler with a frozen water bottle. I’ve done that. It works. If you try to go much above 70F it gets very, very hard to measure out your yeast accurately. I have a workflow that works for me. Yours might wind up a little different. But this is a good starting point. The important thing is to get your workflow figured out and stick to it. I use a timer to keep myself on track. If you are using a starter take it out the fridge the night before you are going to make dough. Let it warm up. In the morning feed your starter. Leave it out on the counter to really get going. Using instant dry yeast? Ignore this step. Put a bottle of water in the fridge. You will want your water at about 40F. Go to work. Or do what you need to do. Enjoy your day. 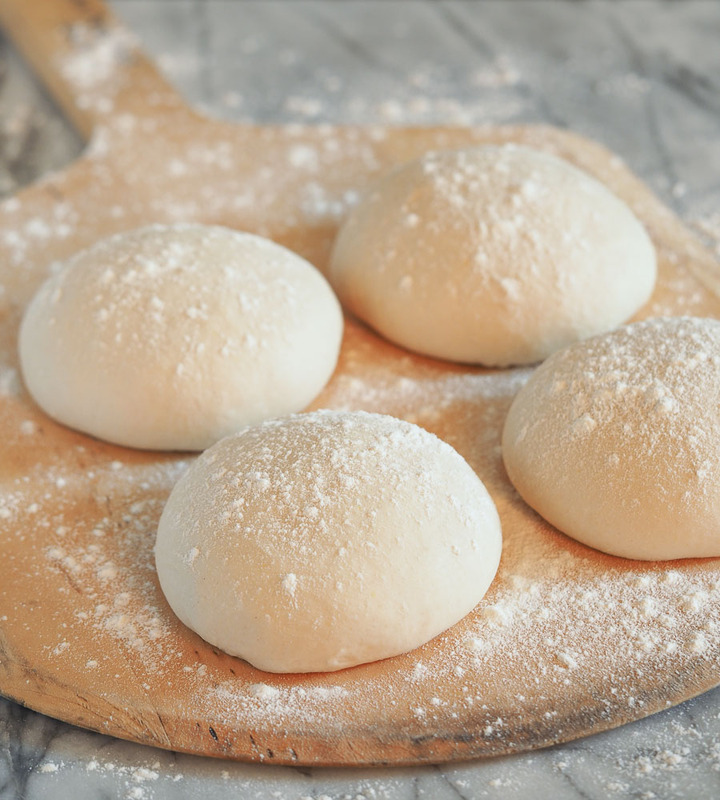 About 48 hours before you plan to eat pizza get ready to make Neapolitan pizza dough. Measure out your ingredients. Pull out your stand mixer. By stand mixer I mean a Kitchen-Aid or Hobart mixer or equivalent. I do not mean a food processor. Put the water in the mixer bowl. Add the salt. Stir to dissolve the salt in the water. Add around 2/3 of the flour and mix it with the water. Add your starter. It’s a little different if you are using instant yeast. Salt kills yeast. So add 2/3 of your flour and the dry yeast to the water. Mix it up. Sprinkle your salt on top. From here on in it’s the same for sourdough starter and dry yeast. Set a timer for 6 minutes. Start your mixer on it’s lowest speed. Let it go about a minute. Add the rest of the flour over the next minute or so. Let the mixer do it’s magic for the next 4 minutes. At the end of the six minutes it should look like a ball of dough. A bit ragged maybe, but a cohesive ball. If it doesn’t, turn the mixer up one setting and let it go until it does. Shouldn’t take more than another minute. You don’t want to overwork the dough. Transfer the dough to the counter. Knead it 27 times. Not 26 and not 28 and certainly not 29. That will ruin it. No. Not really. This isn’t chemistry class. Knead it 25-30 times. Rotate the dough every 5 kneads or so. Cover it with a bowl and set your timer for 12 minutes. After 12 minutes pick up the dough and give it 3 slap and folds. Are you wondering what I’m talking about? Slap and fold? This one took me quite a while to figure out. A slap and fold is just what it sounds like. Take the dough by one side. Now try to hit the back of the counter with the other side of the dough without letting it go. Beat the dough down on the counter but don’t let go. Womp. You are trying to get the dough to extend as long as it will go. That’s the slap. Now take this now long piece of dough and fold it onto itself to halve the length. That’s the fold. Do this two more times. You will feel the dough tighten. Your third slap will hardly extend the dough at all. Cover the dough again and set your timer for 12 minutes. The dough is resting. When the timer goes off repeat the slap and folds a second time. If the dough doesn’t look pretty smooth after the second slap and fold let it rest another 12 minutes. Then repeat the slap and folds a third time. Now you have Neapolitan pizza dough that’s ready to start to ferment. Yes. 24 hours. Plus or minus. 22 hours is OK. 25 is too. The error bars are pretty big here. They call this part the bulk ferment. After 24 hours it’s time to ball the dough. Portion it out into pizza sized balls. I aim for 307 gram balls. Just works that way with the quantities specified. I use a scale to get it right. The goal is to get the skin of the dough pulled tight over the ball. I can’t describe it well enough with words. I think Youtube is your best bet here. You have to see it to understand. It’s a visual thing. Search for “how to ball pizza dough”. I use a 6 inch round Tupperware to ball ferment the dough once it’s balled. I do this because it makes it easier to open the dough when it’s time to cook. Tried 4 inch Tupperware containers first. My life got a lot better when I switched. Trust me. Spray a little oil into the containers. Add your balled dough. The oil just makes things easier. The last thing you want is to be fighting to get your dough out of the Tupperware. Don’t roll Neapolitan pizza dough. Just don’t. Open it. Want that big, beautiful, puffy crust? Rolling it pushes all the air out of the edge. That’s a sure-fire way to get a flat pizza. A dense pizza. Not a beautiful Neapolitan pizza. Watch Youtube. Look for videos where they are pushing the middle of the dough to flatten it. But protecting the edge. Never compressing the outer rim. That’s key. That’s it. You are ready to make pizza. Top your pizza lightly and cook it in your fancy new pizza oven. My guess – it will take you a couple tries to get this down. A few more to get the feel of cooking pizzas in 90 seconds. And a lifetime of tweaking and improving. It is work to make Neapolitan pizza right. But the payoff is worth all of it. When you nail it you will get used to people telling you that you make the best pizza ever. The best they have ever had. I’ve been told better than some in Italy. That’s how good real Neapolitan pizza is. 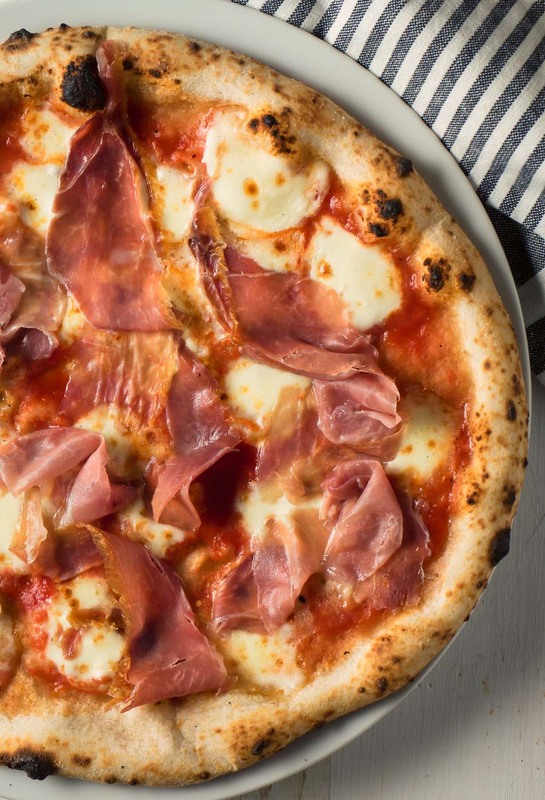 Neapolitan pizza is one of the world's truly great pizzas. To make it you need to learn how to make Neapolitan pizza dough. Sourdough starter or dry yeast - quantity from the table in the post above. Feed your starter if using. Put a bottle of water in the fridge. Go away for 8 hours or so. Measure out your flour, water, salt and yeast. You need a scale to do this. Cups and tablespoons are way too imprecise. Add the water and salt to the mixing bowl of your stand mixer. Add roughly 2/3 of the flour and mix manually. Add the starter to the wet mixture. Add the water to the bowl. Add 2/3 of the flour and the dry yeast and mix manually. Turn your stand mixer on to it's lowest setting. Mix for about a minute and a half. Add the remaining flour. Continue mixing until the timer goes off (six minutes). Look at your dough. If it's one cohesive ball, it's good to go. If not, run your mixer for another minute or so. Remove the dough from the mixing bowl. Knead manually 25-30 times. Cover and let rest for 12 minutes. Use a timer. After 12 minutes, do 2-3 slap and folds. That's described in the text above. Cover and let rest another 12 minutes or so. Set a timer so you don't forget. After 12 minutes, repeat the slap and fold. Put the entire dough ball into a Tupperware. Store the dough in the room you used to measure the temperature and decide how much yeast you need. Let the dough sit for around 24 hours. After 24 hours ball the dough. Use your scale to help you divide the dough. I shoot for around 307 grams. Place it into round Tupperware containers. Let sit another 24 hours. When you are ready to cook, open the dough. Dress the pizza to your taste. Cook the pizza at 750F or so for around 90 seconds. Pay attention. At these temperatures things can go very wrong, very fast. This recipe makes dough with a 64% hydration. You don't need to know what that means but you do need to know it will be a bit sticky so put a fair amount of flour on your paddle to make sure it slides. In italian, main course, sides and stuff. Bookmark the permalink. Wow, this is an extraordinary tutorial. You have me thinking I should consider investing in a pizza oven, something I had never considered before. It’s so much fun. My neighbour has an Ooni. It’s really nice.